Road to your city is a football-city build-up simulation where you slip into the role of a city mayor. You will be responsible for creating perfect conditions that your little town can grow to a big football city. This is not another manager game where you need to set up team formations or do some coaching, it´s more a simulation around your football team. Road to your City released on Steam! after 5 years of development I'm very proud to announce that I've released my first game Road to your City on Steam last Friday! It was a long journey but it was a lot of fun. The game is currently in Early Access. In February I started a Kickstarter campaign to raise a little bit of money to improve the game with more up-to-date graphics, better sounds, more music and so on. Originally end of May was planned for the Early Access but after failing with the Kickstarter I had the feeling "Now more than ever!". So I started crunching and was able to release it last Friday. The start was quite ok. 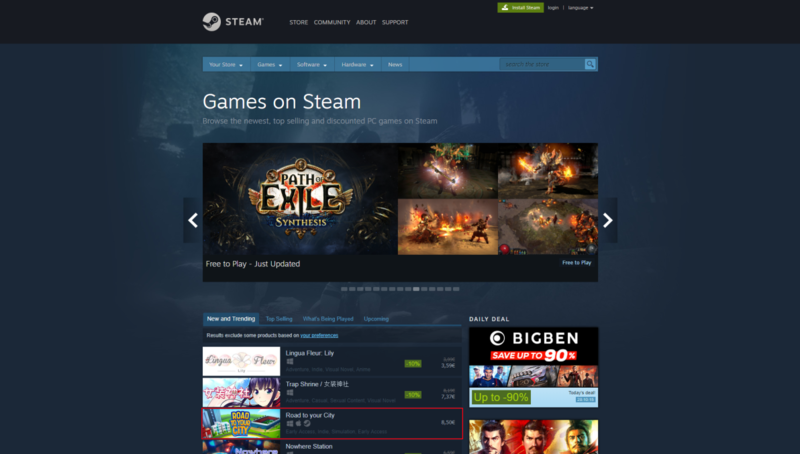 Right now the game is trending on Steam and also has a very good visibility in the sections "Early Access", "Simulation" and "Sport". If you haven't heard about the game so far and you'd like to try it out before consider buying it, there is a demo on Itch.io which you can test. The playtime is limited to 20 minutes but this should be enough time to get a first impression. If you liked the demo or already felt in love with the concept, game or my store, you can get it now on Steam for a very fair price. If you're interested in translating the game in another language than the above, don't hesitate and contact me via mail contact@yheekygames.com" target="_blank" rel="noopener">contact@yheekygames.com. Devlog #10 - Release in March! Devlog #9 - huge feature update & earlier release?! Devlog #8 - Demo available & upcoming kickstarter!